The St. Louis QRP Society (SLQS) celebrated its 30th anniversary on November 15, 2017. The club was organized on November 9, 1987 by Dave Gauding, NF0R and Keith Arns, KC0PP by a gathering of local Hams with an interest in operating QRP and Homebrewing. Twenty-five members attended the anniversary dinner. Each member received a new 30 year ID badge to commemorate the anniversary. Over the years several members have been honored for exceptional work by receiving a member of the year award. This year to celebrate 30 years, the club honored Dave Gauding for his many years of dedication to the club. 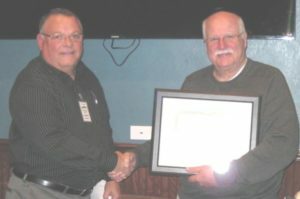 Dave was presented a certificate of appreciation. Dave also received a custom built magnetic loop antenna from the clubs recent magnetic loop antenna project. When the club was organized, it was decided that the SLQS would remain a local club and would not compete with the larger national or international QRP Clubs. The intent of the club is for local Hams to discuss QRP and technical amateur radio subjects. There are no officers or a constitution. We keep it simple, and we believe this has led to its success. The club has put together many kits over the years ranging from transmitters, receivers, transceivers, keys, antennas, antenna tuners and various station accessories. The kits are for members only to keep it manageable and again not to compete with the larger clubs and kit suppliers. The SLQS has many activities throughout the year. Field Day is number one. We also have the annual picnic, swap night, an occasional fall outing and anniversary dinner. The club has produced a monthly newsletter for the past 30 years called The Peanut Whistle. We meet the third Wednesday of each month at the Florissant Valley Community College in the 1st floor conference room of the Engineering Building. Everyone is welcome to join us. The meeting begins at 7:30 p.m.